197. Plean Tower. The subject of this article is a group of buildings sometimes known as Menzies Castle, which stands just over three-quarters of a mile ENE. of the village of Plean and 300 yds. E. of the Glasgow-Stirling railway. The most prominent feature of the remains (Fig. 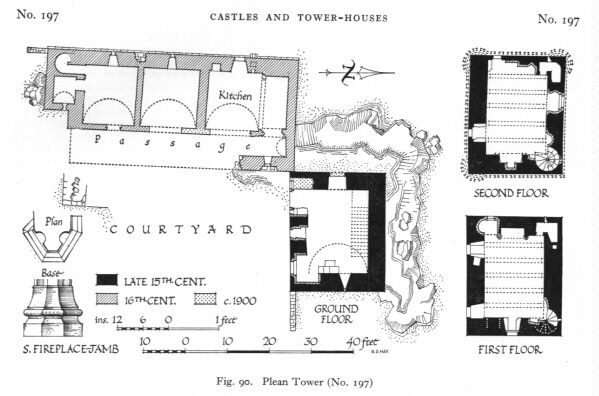 90) is a small rectangular tower-house which may be ascribed to about the second half of the 15th century; during the following century a courtyard was added to the S. of the tower, but of this there survive today only a few fragments of walling together with the range of buildings that formed its W. side. Both the tower and the W. range of the courtyard had become ruinous by the end of the 19th century,1 but shortly afterwards the tower was extensively restored, raised a storey in height and made habitable. The house that stands a few yards to the S. of the courtyard was erected at the same time. None of these buildings is inhabited today, but some are used for storage. The tower (P1. 99 A), which occupies a good defensive position, is situated on a rocky outcrop from which the ground slopes away on the N. and S. sides; to the W. there is an area of marshy ground through which there flows a small burn. The building measures 27 ft. 10 in. by 22 ft. 9 in. over all, and rises to a height of four storeys; the masonry is of rubble, roughly brought to courses, with dressed quoins and margins. The original openings have chamfered arrises and some of the larger windows, which for the most part have been glazed and barred, have relieving-arches. The walls have a slight batter at their base, while at third-floor level they oversail on a continuous corbel-course, above which, on the W., S. and E. sides, there is a course of individual stone corbels. This suggests that in the original arrangement a parapet ran round at least these three sides of the tower and perhaps the N. side also, although there are no individual corbels on the N. Above this level the walling dates only from the period of the restoration. There was probably a cap-house above the stair in the NE. angle and there were rounds at the SE., SW. and NW. angles, but the cap- house was removed and the rounds rebuilt when the tower was raised in height. The uppermost parapet today gives the tower something of the appearance of a folly. An original entrance-doorway is centrally placed in the W. wall at ground-floor level, and can be approached only by passing along the rocky ledge that skirts the N. and W. walls of the tower. The doorway, which is now blocked, is round-headed; the inscription on the arch- head is of no antiquity. The larger window at first-floor level is an insertion, but the smaller one, to the N., is original, as are also the windows on the second floor. In the N. wall there is an original stair-window between first- and second-floor levels, but the large window on the second floor has been inserted or enlarged. The small stair-window between the second and third floors is an insertion. In the E. wall there is an original window, now blocked, at ground-floor level, another at first-floor level and a third, which serves the stair, at second-floor level. The main entrance-doorway of the tower is situated at the E. end of the S. wall at first-floor level, and was originally reached by a forestair.1 This stair probably rose against the S. wall of the tower, but it has been removed and the entrance itself, which is square-headed, has been turned into a window. All the openings on the ground floor seem to have been formed at the time of the restoration of the tower; it is difficult to explain the window at the extreme W. end of the wall, now blocked and inaccessible within, except as a dummy. One jamb of this window has a chamfered arris and the other a sharp one. There is an original window at both first- and second-floor levels. The interior of the tower has been greatly altered and few original features remain; much of the internal wall- surface is decorated with figure carving and pseudo- heraldic ornament on stone and plaster, but this is all of recent origin. The ground floor contains a single apart ment, originally a barrel-vaulted cellar; the vault has been removed, but its outline may be seen on the E. wall. The only access from the exterior was by the doorway in the W. wall (supra), but a hatch in the vault no doubt communicated with the room above. The stair and the fireplace are insertions. The main entrance-doorway of the tower led directly into the single apartment that occupies the first floor and no doubt served as the hall. In its W. wall there is a large fireplace, the N. jamb of which, together with the high moulded bases, is original (Fig. 90); the S. jamb and the arched lintel are of later date. The original window-recesses have stone seats in the ingoings, while the one in the S. wall has in addition a shelved cupboard in its E. reveal. There is a blocked-up doorway at the S. end of the E. wall, and this probably opened into a cupboard of which there is now no other trace. In the NW. angle there is an original garderobe, but the mural recess in the SW. angle has been contrived at a later date. The beams of the ceiling were borne on rough stone corbels, most of which still remain. In the NE. angle an original turnpike-stair rises to give access to the second floor which, like those below, was designed to contain a single room. This apartment, however, was subdivided at the time of the restoration of the tower; the fireplace in the W. wall was inserted at the same time, but the one in the E. wall may incorporate older work. The original windows have had stone seats in the in- goings; the stone corbels for the support of the ceiling joists remain as on the floor below. There is a garderobe in the NW'. angle. The stair in the NE. angle originally continued upwards to give access to the parapet, and probably finished in a cap-house, but the upper part of the stair was renewed when the top storey was added to the tower. Of the courtyard that was added to the S. of the tower during the i6th century, little remains today except for the lowest storey of the W. range. The enclosure is said to have been completed by walls to the S. and E.2; the E. wall has now completely disappeared while to the S. there remain only some scattered traces of foundations which are noted on the plan. The W. range is built in rubble with dressed quoins and margins; the original openings have chamfered arrises and the windows have been barred. A break in the masonry of the W. wall reveals a shaft which served a garderobe on an upper floor, and this indicates that the building originally rose to a height of at least two storeys. It now finishes at first-floor level in a crenellated parapet which was added at the time of the restoration of the tower. On the ground floor the range contains a series of barrel-vaulted apart ments which were originally entered from a corridor on the E. Only the N. portion of the corridor remains and this contains a window, now blocked, in the R wall. The northernmost apartment was a kitchen, and a large, arched fireplace remains in the N. gable; there is a window in the W. wall and to the S. of it a shelved cup board. An opening at floor level to the N. of the window probably marks the position of a sink, the outlet of which can be seen on the outer face of the wall. The cellar that adjoins the kitchen to the S. retains no features of interest, but the southernmost apartment contains a doorway in the SW. angle, now blocked and filled with rubbish, which may originally have led into a stair giving access to the floor above. To the E. of this opening another doorway leads into a small barrel-vaulted chamber which is contained within a return of the walling at the S. end of the range. A gun-loop in the R wall of this chamber covers the probable line of the S. wall of the courtyard. 3 Ibid., 320-3; The Scots Peerage, viii, '0.